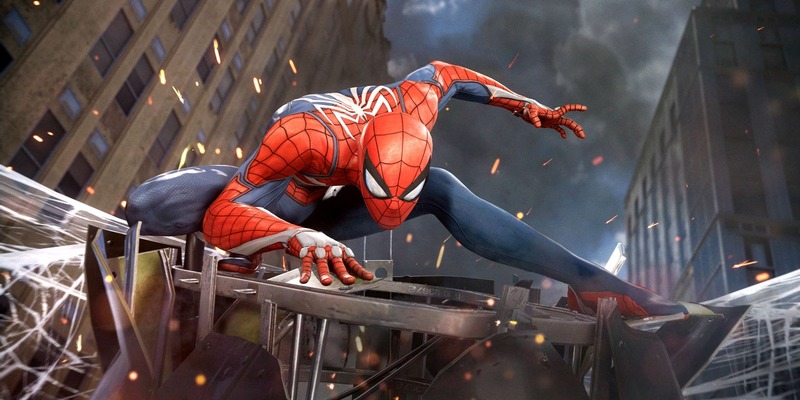 The game begins with you swinging through the city as Spider-Man (Peter Parker) which is a great start and it gets you right into the controls of the game. 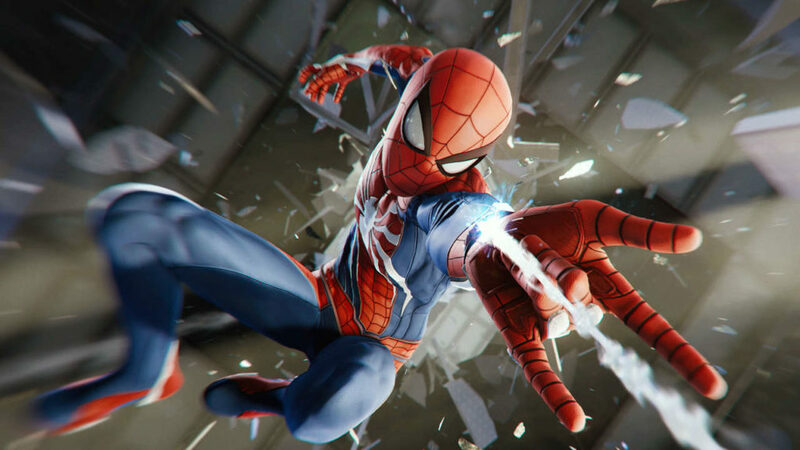 Practice basic moves and get a hang of it while you enjoy yourself as the friendly neighborhood web slinger. 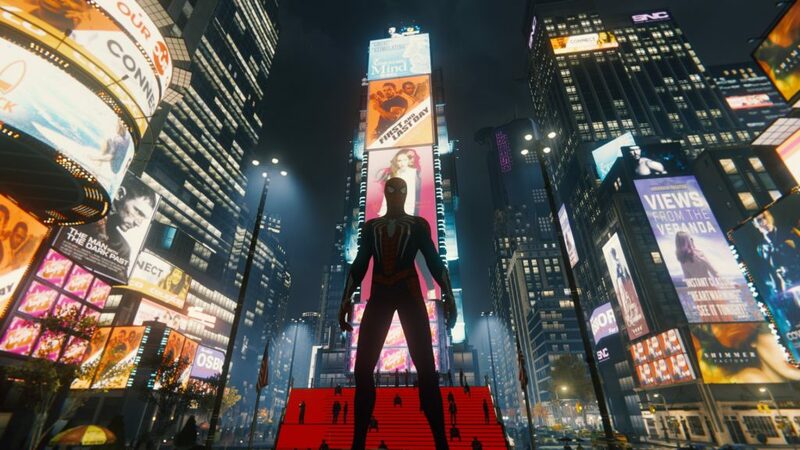 Once you get to know the stuff you need to know, head to Time Square but you wont be going there for sightseeing or taking selfies which by the way you can take in the game. Follow the chopper, just keep following the damn thing and you will receive a call from the Police Captain Yuri Watanabe. You would want to go after the boss dude but the Captain will have different plans for you. The screen will show you the marker for the objective, take a swing towards it and head to that. It is a choice though, but i’d say try the detour per Captain Watanabe’s request. As you approach the area, the cop cars will be visible from far away and you will know where to go without looking at the marker. Bad guys will be pummeling the cops until you arrive. The cut scene will explain the situation so let it play. Once you see the cops can’t get the job done, take a swing at the bad guys yourself. This is the time to learn how to use your web in combat. Use Web Strike to zip into an attacking enemy. It is one of the most effective moves to close your distance to an enemy, so learn it well. Simply pressing the melee button (Square) will release a 4 hit combo and subdue most enemies. make sure the enemies are down and out or they will get back up and get back to attacking you. 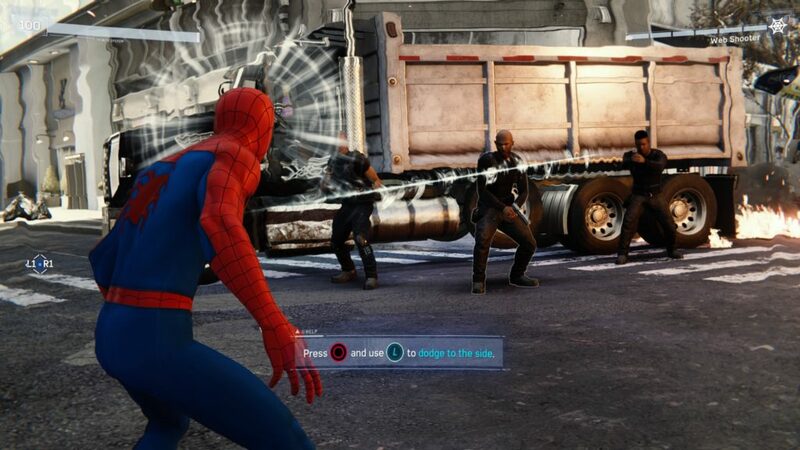 Spidey sense will come into play here when you are surrounded by multiple opponents. You will see an alert thing on top of your head and that is the trigger for you to move away to avoid being hit. The window is brief but enough for you to make a decision. Either hit them first or dodge, depends on your style of combat, you can do either but in case you have low health, stepping out of the way is the way to go. Bad guys are plenty in this game so don’t think that one group is all there is, once you take thees guys down more will appear. This time around they will be armed and ready to gun you down. Use the Web Shooter by tapping R1 rapidly to wards them and they will be covered in web, unable to move. 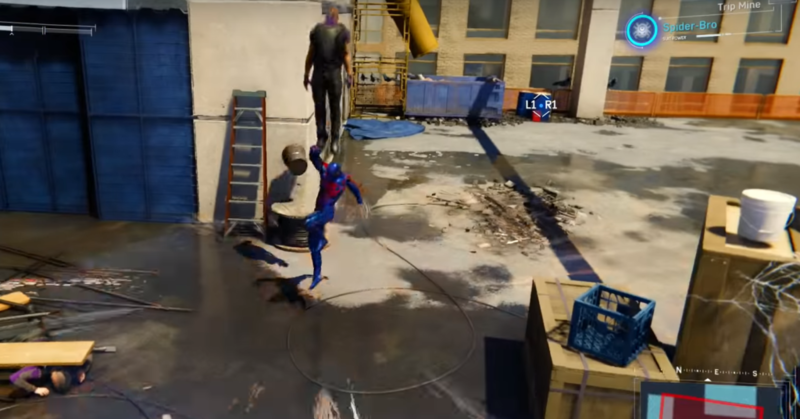 Some stronger enemies can break free of this but small level soldiers won’t so you can sue the Web Strike and take them down using the Square combos. Web Shooter has sic charges and stay there for you to use at any time only 3 will be enough per standard guys. It regenerates though, your web tank so you can use it over and over again. Keep moving and avoid being hit by bullets coz they drain your health real fast plus dying in the first mission would look bad. 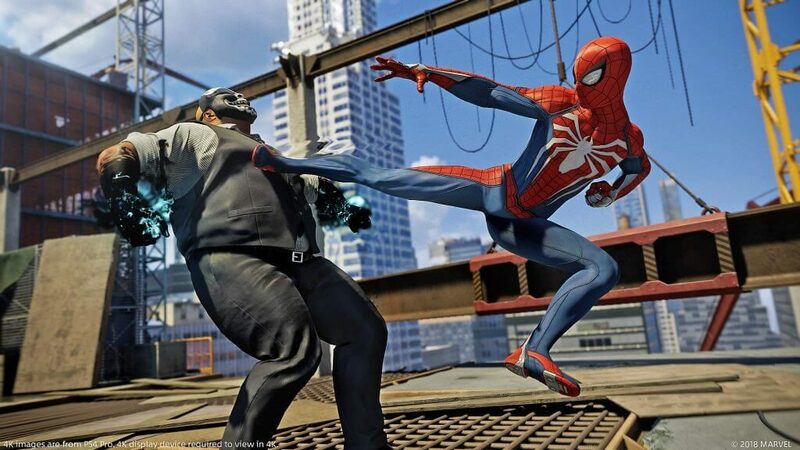 Upper cut is a super cool move, if you hold down the square button, Spider-Man will perform this move which can knock enemies into the air for extended combos. Meet them in the air and tap the square button to perform mid air combos. You can also yank them down and by pressing triangle button and stomp on the using the X button. There are a wide variety of combos you can perform after the uppercut so make your own and stick with it. Getting that muscle memory going to deal with a tense situation will save him. Besides most non armed enemies can’t hit you in the air so it is cozy up there. This here is the place where you can learn combos, simple aerial and projectile combos to ease your time a bit moving forward. If the health gets too low, simply swing away and catch a breather and return to get some more. Keep at it until you are well versed in the basic combos and movements.